A 33-year-old NYPD officer was killed in a confrontation with an armed suspect fleeing police on a pedestrian overpass over the FDR Drive in East Harlem Tuesday, officials say. Randolph Holder was pronounced dead at Harlem Hospital at 10:22 p.m., shortly after he was taken there in critical condition, NYPD Commissioner Bill Bratton said in a news conference. His family was by his side. Holder and other officers responded to a report of gunshots fired near East 102nd Street and 1st Avenue in Harlem at about 8:30 p.m. Tuesday, Bratton said. A victim at the scene told responding officers his bicycle had been stolen at gunpoint. Holder and other plainclothes officers encountered a man on a bike on a pedestrian overpass over the FDR Drive at East 120th Street, Bratton said. The man and police exchanged gunfire, and Holder was struck in the head. He was taken to Harlem Hospital in very critical condition and died there. 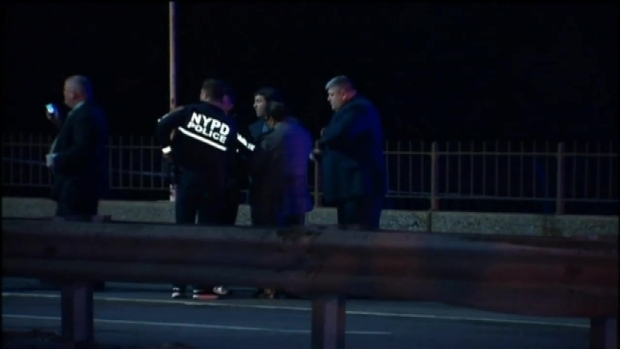 Meanwhile, the suspect ran away northbound on the FDR Drive promenade along the East River, and he was apprehended by officers at 124th Street. He had a gunshot wound to the leg and was taken to Cornell Hospital, where he's expected to be released Wednesday morning and into police custody, according to Bratton. Three others were taken into custody at East 111th Street and FDR Driver and are being questioned. At least one gun was recovered, sources said. The FDR Drive was shut down in East Harlem where an officer was shot in the head during a confrontation with a suspect, according to sources. Video of police activity at the scene. "I extend our deepest condolences to his family," Bratton said, speaking on behalf of the NYPD, "especially to his father, who in his time of grief sought to comfort the officers from PSA 5. He was strong enough and brave enough to go in and address them. As they tried to comfort him, he in fact was comforting them." Dozens of uniformed and plainclothes officers had lined the hallway at the hospital in the moments after Holder was taken there, while other officers held each other as they arrived. Mayor Bill de Blasio said at the news conference, "This whole city is in mourning, mourning a man who gave his life as a guardian for all of us, and we're humbled by Officer Randolph Holder's example, example of service and courage and sacrifice." "Our hearts are heavy and we offer our thoughts and our prayers to his family, who are experiencing unimaginable pain, as we saw earlier when we gathered with them," he said, calling Holder "an immigrant who wanted to give back to his city and to his country, who had an exemplary record as a police officer, who did everything the right way." The FDR Drive remained closed in both directions between 96th Street and 125th Street early Wednesday. Drivers were urged to expect extensive delays and consider alternate routes. Holder is the fourth NYPD officer killed in the line of duty in the last 11 months. Brian Moore, 25, was shot in the head while sitting in an unmarked patrol car in Queens last May; he was taken off life support two days later. ;Rafael Ramos and Wenjian Liu were shot in the head as they sat in their patrol car in Bedford-Stuyvesant in December 2014, days before Christmas.